Have you ever wondered what having a guide dog is really like, how are you assessed and what training is involved? 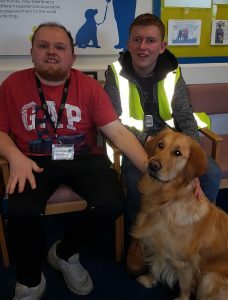 Following their assessment, they were both invited to Shireview Guide Dog centre in Leeds (photo right) to get used to walking the dogs and learning how to keep a guide dog such as grooming and feeding. They had lots of time to ask questions in preparation for their new friends arrival. We will follow them through their journey to discover their highlights and challenges along the way. If you would like to know more about Guide Dogs please visit their website here.